*I received a copy of this book from the publisher for review purposes. It has in no way influenced my opinion. Last week I reviewed Sorcerer to the Crown. (If you'd like to read my review, click here.) I fell head over heals for that book. And I was ecstatic to jump back into the world that Zen Cho has created. If you haven't had a chance to read Sorcerer to the Crown yet, don't worry, this book can be read as a standalone. However, you're going to want to read the first book because it's awesome. 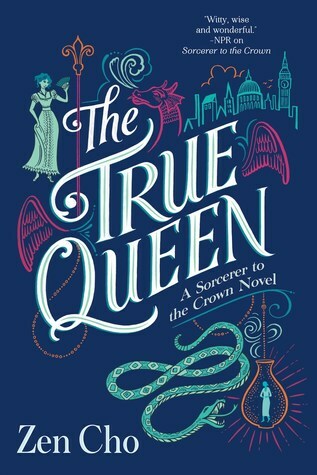 The True Queen takes place two years after Sorcerer to the Crown ended. The book begins with two sisters, Muna and Satki, waking up on a beach. They have no memory of who they are or how they got there. The only thing they do know is that they're sisters. And they're cursed. Satki is slowly disappearing, so they are sent to the Sorceress Royal by Mak Genggang. On the way there, Satki disappears. Muna must head to England and find a way to save her sister. Dragons, capers, mysteries, regency era, balls, fairies, magicians, and that's just the first few chapters. Cho could have gone in any direction for the second book in this series, but I love the way she went. Her characters are, once again, fantastic. The story line had me glued to the pages. I just want more of this type of novel. It checks so many boxes on my list that I can't wait for the third book in this series to come out.